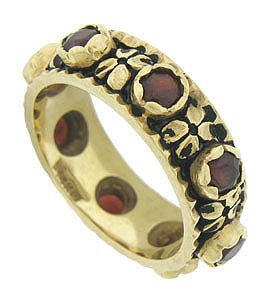 This breathtaking vintage wedding band is fashioned of 14K yellow gold and set with eight round cut garnets. The deep red stones are set into elevated floral inspired mountings. Boldly engraved blooms interrupt the dazzling garnets. 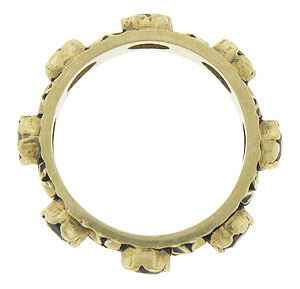 The surface of the ring is darkened to add greater interest to the floral engraving, while the edges of the ring are deeply scalloped and polished smooth. The vintage ring measures 6.68 mm in width. Circa: 1950. Size 7 1/2. We cannot re-size.